Accidental disconnection of components of the breathing system during general anesthesia with an endotracheal tube persists as an occasional problem. It seems more likely in face surgery where the tube is in the midst of an active surgical field and not accessible by the anesthesiologist. While the potential for great danger during controlled ventilation or the entrainment of room air and/or rebreathing during spontaneous ventilation still exists, modern electronic monitoring will almost always sound alarms and convey information that leads to rapid discovery and re-connection of the wayward breathing system components. We report an unusual case of breathing system disruption with a misleading presentation in that the capnogram appeared normal and there was no gas irregularity. A 50-year-old female was undergoing a facelift. After routine anesthesia induction and intubation with a standard 7.5 mm endotracheal tube, the operating room (OR) table was turned 180°. The breathing circuit elbow piece was removed and replaced with a straight connector between the tube adapter and the circuit Y-piece. All connections were snugly pushed together. The patient’s face, neck, endotracheal tube, and distal breathing circuit were prepped into the field. A clear plastic 45 Yen 60 cm Steri-Drape™ 1010 (3M, Minneapolis, MN) was spirally wrapped around the parts of the endotracheal tube, connector, sample tubing, and circuit that were in the surgical field (see photo). After approximately 1 hour of surgery, with the patient on controlled ventilation, desflurane at 1 MAC in 1 L/min oxygen, the reservoir bag of the Dräger Apollo anesthesia machine was noted to be completely empty, and, at the same time, the “low volume” alarm of the machine sounded. The capnogram showed a pattern characteristic of spontaneous breathing, with the waveform returning to baseline during each breath. There was no decrease in FiO2. Oxygen flow was increased from 1 L/min to 10 L/min with no filling of the bag or change in the alarm. Careful inspection revealed that the 15 mm connector had come out of the end of the endotracheal tube. The surgeon quickly grasped the enfolding plastic drape and pushed the enclosed connector back into the endotracheal tube. Photograph of extensive wrapping of tracheal tube and connection, which delayed detection of the disconnect. Of particular interest in this incident is the fact that the plastic drape wrapped around both the distal circuit tubing and the endotracheal tube prevented significant entrainment of room air and kept the fresh gas flow from completely dissipating away from the patient. There was no CO2 rebreathing under the drapes as is often seen with disconnects in facial cases. The discontinuity did cause loss of measured expired volume and some pressure, which activated an alarm. The capnograph alarm was not triggered because the capnogram persisted. Obviously it was necessary and desirable to replace the 15 mm connector into the endotracheal tube, and this was easily accomplished. The unusual placement of the circumferential plastic drape combined with spontaneous ventilation created a unique circumstance that in one way reduced patient danger (fresh gas remained available), but in other ways increased danger in that the characteristic disappearance of the capnogram did not occur with this disconnect. 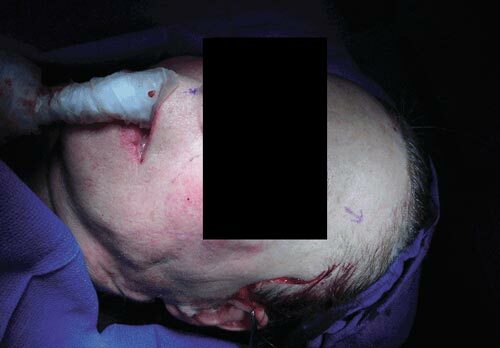 Anesthesiologists and nurse anesthetists should have heightened awareness of breathing system continuity during major facial surgery and of the potential unusual implications of encasing all the connections in a wrap of sterile plastic drape.